All of our people are devoted to children and are committed to providing the best childcare possible. We operate a safe childcare recruitment policy which insures that all our team meet the very highest standards of suitability and dedication. All staff members are Garda vetted and written references are verified prior to engagement. Our management protocols guarantee that all new team members receive training and oversight and ensure they meet with our standards, vision and ethos. All our team participate in ongoing training and our policies and procedures are reviewed annually in line with evolving standards of best practice. 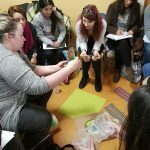 Read about our recent training workshop here. 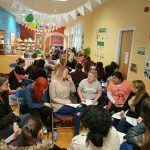 Each crèche has a manager and a deputy manager, both of which are supernumerary, that is they are not included in the ratios, in order to support the crèche, to lead and role model practice. In addition, each centre also has a supervisor or maybe two, who are experienced staff members who support both the management team and develop practice in our crèches. We always have a qualified first-aider onsite at all times to deal with those every day bumps and scratches. Every crèche also has a dedicated cleaner who ensures that our crèches are kept sparkling clean, with excellent hygiene standards, ready for the children each day. We know it’s our people that make us great, so we make sure we reward and recognise our teams. 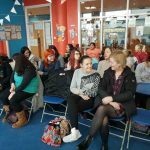 When we choose our staff we are looking for staff that are passionate about childcare, love what they do and strive to provide a fun, happy and safe environment for children to play, learn and thrive. 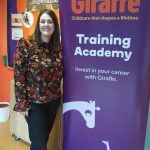 We run an induction programme to ensure all staff learn about the Giraffe approach, know all our policies and procedures and are ready to nurture, love and care for all the children. In the recruitment process, we match new recruits to their own area of interest, be it younger children, preschool or Montessori. New recruits choose us because we invest in our teams and offer opportunities for career progression and ongoing training and development. I have been working at Giraffe for four years. 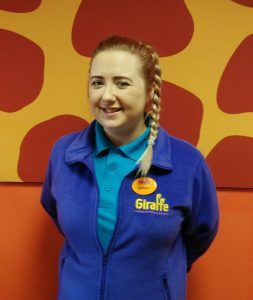 I have completed my FETAC level 6 degree, and am currently the supervisor for Giraffe Childcare Liffey Valley. I take great pride in my role in Childcare and am dedicated to ensuring both the parents and the children I work with are receiving all that they need! I really love my job because every day is different, because no two children are the same, and this makes everyday something to look forward to! – Sarah M.
Our supervisors, deputies and managers are usually promoted from within and have grown with us to become confident leaders. During recruitment, we place importance on staff engagement as it’s hugely important that our staff feel valued and rewarded. All our staff have access to regular ongoing training so that their skills and qualifications are up to date. We hold regular team meetings so that our teams work smoothly together and have a shared approach. We believe that our team approach works best. Read about our team members here. If you’ve got what it takes be part of the Giraffe team and have a desire to work alongside passionate and experienced professionals, Apply today!